Authorities in Brewster County say they seized 1,264 lbs. of marijuana from a truck that fled from a traffic stop, leading police on a high-speed chase through rugged pastures. According to the Brewster County Sheriff’s Office, on Wednesday around 8:35 AM deputies attempted to pull over a white Chevrolet truck. The truck reportedly stopped, but then sped off at a “high rate of speed” before deputies could approach the driver. At that point, the sheriff’s office says, the deputies began chasing the vehicle on foot, and “unknown individuals” jumped out of the truck and ran into the nearby mountains. Brewster County Sheriff Ronny Dodson said it’s believed there were two people that fled. As of Thursday morning, they had still not been found. 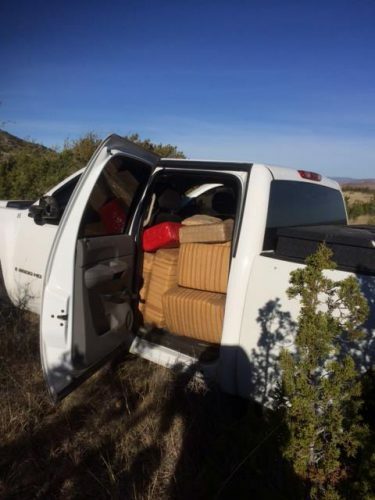 The truck was found to be loaded down with multiple bundles of marijuana. This entry was posted in KRTS News and tagged alpine, Brewster County, Brewster County Sheriff's Office, Crime, Marijuana Bust. Bookmark the permalink.